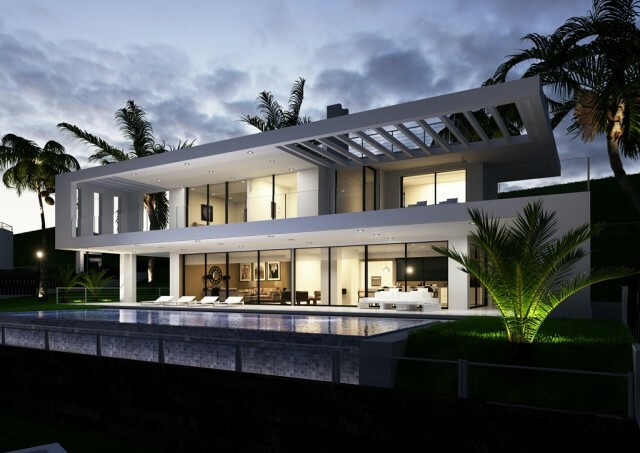 Brand new south facing villa in the gated community, in the heart of the golf valley of Nueva Andalucía, close to several championship golf courses of the Costa del Sol and only five minutes away from Puerto Banús and Marbella Town. This modern villa will have an open plan living and dining area with fireplace and French doors leading on to the terrace and the garden which has a private swimming pool and beautiful views of the sea and golf course, a fully fitted kitchen, master suite, four guest bedrooms and four guest bathrooms. There is also a large solarium on the roof with a jacuzzi. Other features include:- an alarm system, hot and cold air conditioning, under-floor heating throughout, marble floors and double glazing.